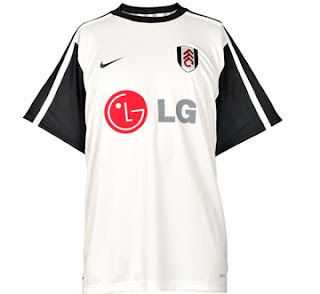 For so many reasons we're quite glad to finally bring you the Official Nike Fulham Football Club 09/10 Home/Away Kits! Not least of which being that Clint Dempsey is one of our favorite players. The Whites are a rising force in England and we are proud to have a unique relationship with the club, which we hope only grows and grows. The new white home shirt features the return of black on stylish new shoulder panels, and the away jersey is clean red with sleek lines down the sides; both have the embroidered Fulham crest over your heart and are made of Nike’s advanced Dri-FIT® fabric, which keeps you drier, cooler and lighter by drawing sweat from the body to the fabric’s surface, while its three-dimensional construction gives more air space around the skin to reduce clinging, and keeping you cheering on your team comfortably.